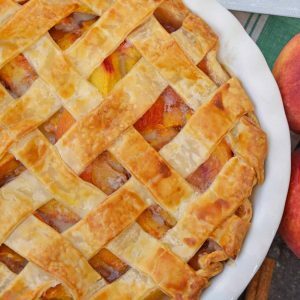 Southern Peach Pie a traditional peach pie using fresh peaches baked in a flaky, buttery lattice crust. If using fresh peaches, follow these directions to peel your peaches. If your pie plate is shallow, use 5 peaches. For a deep pie plate, use 6. Cut peaches into wedges, discard the pit, and transfer to a large mixing bowl. Toss cut peaches with sugar, cornstarch, ground cinnamon, ground nutmeg and lemon juice. Cornstarch will vary based on how many peaches you use. Four to five peaches, use 3 tablespoons and five to six, use 4 tablespoons. Unroll one pie crust into a 9-inch pie plate. Fill with peaches and juices. Either unroll the whole pie crust on top of the filling, pinching edges to seal and cutting a few slits in the top OR create a lattice pattern using strips. Brush the top of your pie crust with the lightly beaten egg. Discard the rest. Bake for 45 minutes, checking about 20-25 in to make sure the top crust isn't burning. If it is browning too fast, loosely over with a piece of aluminum foil. Remove and allow to sit at room temperture for at least 3 hours before serving. Serve with vanilla bean ice cream, fresh raspberries or raspberry sauce. If you've tried this recipe, make sure to come back and let us know how you liked it!